This is a difficult one to answer. I asked some buddies over at Etsy’s European Street Team for help, and they came up with a diverse group of descriptions: naive, cute, elegant, organic, whimsical, and nostalgic, among them. And all of that true, as I do come up with a lot of different stuff. At a recent crafts show I did here in France, people kept saying about my products, C’est poétique! That sounds good to me! So maybe we’ll keep that? 2. One of the hardest things for artists to do is to stand apart from everyone else. How difficult was it for you to come up with your own style and signature look? What advice can you give aspiring artists struggling to find their own voice and look? I’m still struggling, to tell you the truth, but I do think I’m getting there. What I think works best for me is to remember what had always moved me since childhood, memories of forms, colors, and patterns, or even just a feeling. That and working a little bit every day. This can be hard, with all the other things we have to do, but I think it is very important to devote daily a little bit of time to our art or our craft; to really make it part of our life. 3. You, like most people enjoy the process of making and crafting and didn't get into it for the sake of "business". But eventually you found yourself having to make the transition from crafter to a businessman. What have you learned so far and what advice can you give others in the same situation? When I am creating, I am just a craftsperson, and try not to think about if what I am making will sell or not. I do it for the pleasure of it. I was working for more than a decade for media enterprises, primarily in women’s magazines, and in the latter part of my career as editor-in-chief. A big part of that job was making sure the magazine sold, so I did not really have a very difficult time making the transition to selling. I do, however, make an effort to make the two jobs separate: When I am creating, I am just a craftsperson, and try not to think about if what I am making will sell or not. I do it for the pleasure of it. When I exit from my workroom, that’s when I transform into a businessperson, and begin to ask myself, Now how the heck am I going to sell this thing?! 4. You're just now beginning to offer your products to brick and mortar shops in France and in the US. Any early lessons that you can pass on to our readers looking to do the same? I am just really beginning to do this, so just one lesson: Make sure that the store you’re offering your products to fit your style. 5. As somebody who was born in the Philippines, I can't help but applaud your efforts in promoting the relatively unknown Filipino visual arts scene in Europe. Can you share some links and/or artist blogs so that Heart Handmade readers can get a little taste of the undiscovered talents from our country? 6. Congratulations on signing a book deal. Can you give us a sneak peek at what it will be about? PROBINSIYANA: in Filipino, a female living in the province. PROVENCIANA: a career-driven Filipina gives up life in third-world-but-happening Philippines to resettle as immigrant housewife in the middle of first-world nowhere known as Provence. 7. There are tons of people out there who are currently doing something that they're not 100% happy doing. Do you remember the exact moment when you made the final decision to leave the world of media and immerse yourself in your writing (and sewing)? Can you walk us through your own thought process and the steps that you took before you were able to leave the world of media? Did you just wake up one day and say You know what? I'm quitting and I'm going to write!, or was it a more deliberate process? Although I had always wanted to write fiction, I was quite happy doing the career-girl thing, writing and editing for newspapers and magazines, until I was about to hit my 30s. Then I started getting sick from the stress, and had to go to doctors and hospitals all the time, and I didn’t want to die having articles on how to lose weight, save money, or dress up like a Hollywood star be my only contributions to the planet! I went to an island, rented a basic hut, and just read, wrote, swam, and scuba-dove. For 10 years, the longest break from work I took was five days, so I decided I deserved a long holiday and took a three-month sabbatical. And I did nothing! I went to an island, rented a basic hut, and just read, wrote, swam, and scuba-dove. Taking myself away from my regular environment, and all the trappings of big-city life, really opened up my mind and my spirit to all the other possibilities available to me. So from there I began to make plans, saved up, and a year and a half later, I quit my big, stressful job and began living what I believe is an infinitely more creative (though maybe less economically rewarding!) life. Your book sounds awesome and congratulations on that! I also love your story of how you got out and simplified everything. It sounds simply lovely. What a great interview! Thank you Apol and Mairchelle! Marichelle, I think I have fallen in love with you :) I love how this looks, and all the bits and bites everywhere makes it such a dynamic read. And can I please oh please have a copy of that image of the apple in a trash can? It is so me! P.S. Someday in New York, we shall giggle and laugh loudly together in public, I am sure. It was fascinating to learn more about La pomme! She sounds has interesting as her work, great interview! 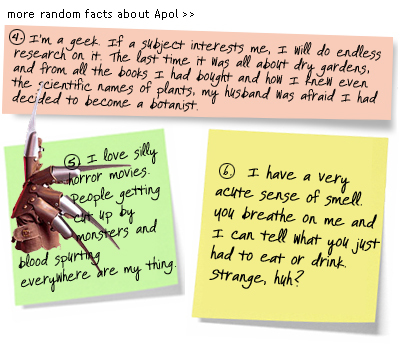 Apol is a great person and artist, always nice to learn more about her! Great interview! But I can remember all items from her heart ..